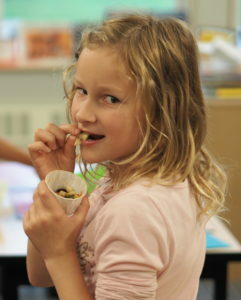 “This is the best salad I’ve ever eaten!” exclaimed an excited third grader at Geneva elementary last week at the end of class, upon tasting her kale salad, the first recipe of our Winter Cooking Season 2018-2019. Students around the city and county have had similar exclamations as they’ve tasted their yummy salad with homemade honey mustard dressing. Now that school gardens have been put to rest for the winter cooking season is in full swing. 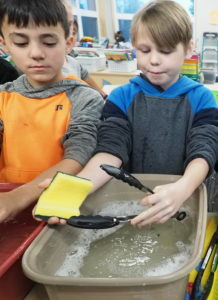 An aroma of fresh seasonal veggies has begun to fill the classrooms at schools as food educators, armed with all the fixings for a great kale salad, greet eager food scientist students. 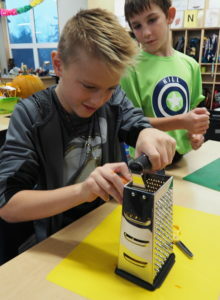 During their class time, food scientists are learning about knife and grater safety, or refining their skills from previous years. Students take turns cutting the radishes with the “bear claw” technique while other students shred the carrots. 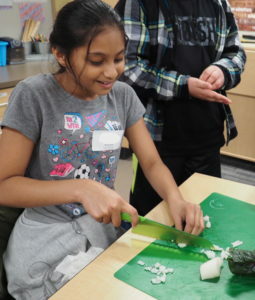 Everyone helps to rip the local, fresh kale into bite size pieces and some students cut the chives. Don’t forget the ¼ cup of cranberries! Oh what fun it is to see how all of these ingredients taste together once they have been cut up and mixed with the freshly whisked dressing. While all of the various jobs are happening to create this yummy salad, discussions of seasonality are taking place in the classroom. 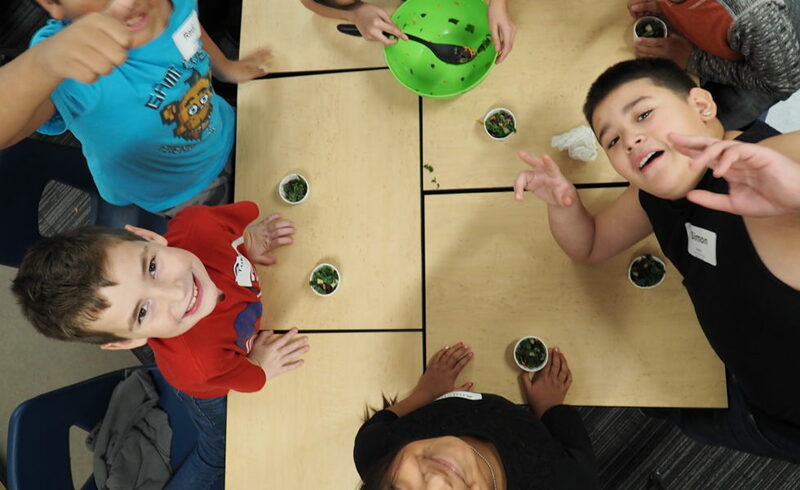 Students are learning that all of the fresh ingredients in their salad are in season right now in our area. When we shop for what is in season, we not only save money, but also help our local farmers and get the tastiest, most nutrient dense fruits and veggies available. 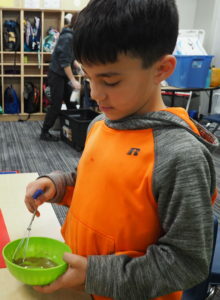 Students often enthusiastically discuss ways they would change the recipe at home to include more colors of the rainbow or simply fit their taste buds better. These eager food scientists have come up with some very creative ideas! We want to say a huge thank you to everyone who has helped support us in another winter cooking season. We could not do this without the support of teachers, students, or their families and the many local farmers who have generously donated their produce to us for this first recipe of the winter. You can find the Kale Salad recipe here.